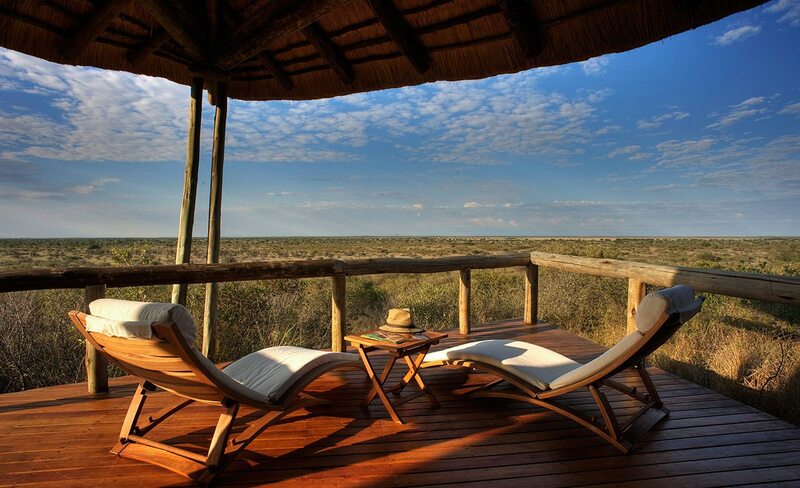 A perfect combination of safari and beach destinations, from the vastness of the Central Kalahari and Savute grasslands to the almost infinite expanse of the Indian Ocean, united by a common sense of space, remoteness and pristine natural beauty. 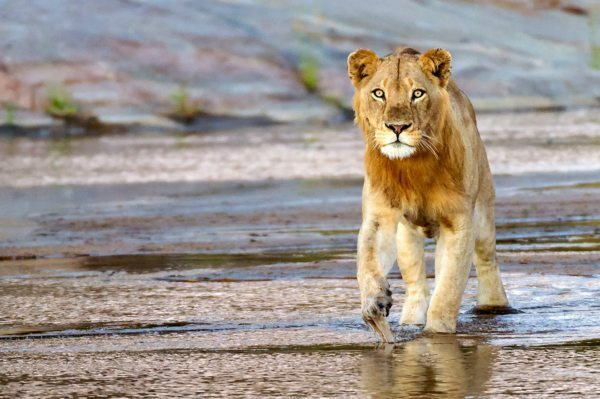 The chance to witness different migrations on the same luxury safari (zebra herds along the Savute Channel and humpback whales off the coast of Mozambique) plus opportunities to see black-maned lion, go on a game drive along the Savute Channel, enjoy a sandbar picnic and snorkel the reefs of Mozambique. 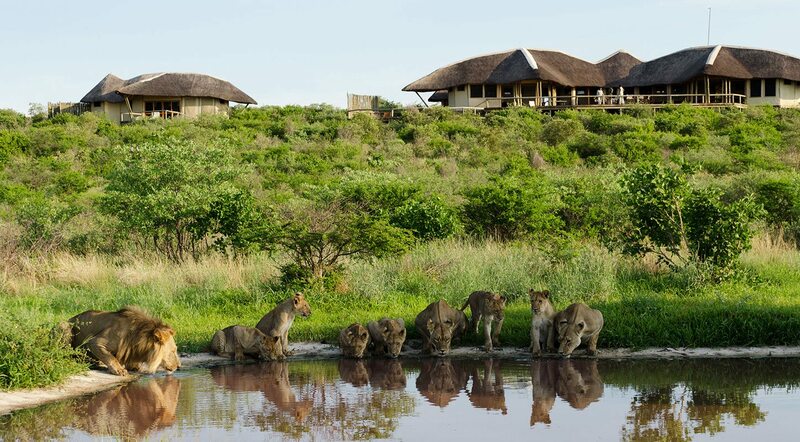 Each luxury lodge consisted of thatched-roof accommodation, styled to fit in with the surroundings, and overlooking water in the shape of a waterhole, a channel or the sea. There are pools at each lodge. 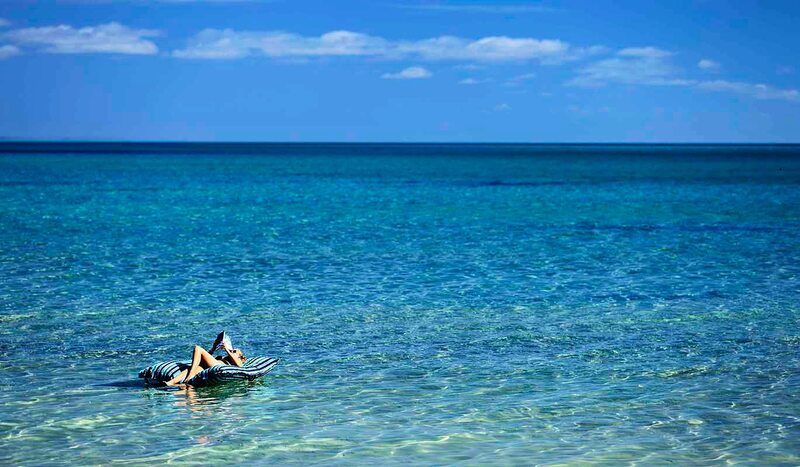 For more information see Tau Pan, Savute Safari Lodge and Azura Benguerra Island. The flight from Maun into the Central Kalahari was nowhere near long enough to count as interplanetary travel, but the change in scenery was otherworldly. With the vast open space of Tau Pan stretching out below us, we felt as though we could see forever. This impression was not diminished by landing – from the sandy ridge where the lodge was situated, we could gaze across the waving grasses (newly green after the first summer rains) and count literally hundreds of oryx and springbok enjoying this bonanza. They had struck it lucky in terms of grazing; we had too, scenically-speaking. The rest of the day we relaxed.The next morning we chased away the briefest of pre-dawn chills with a coffee before heading out on our first Central Kalahari game drive. It felt almost being like on a boat as we parted the sea of grass, and at times, edged our way gently through the herds. 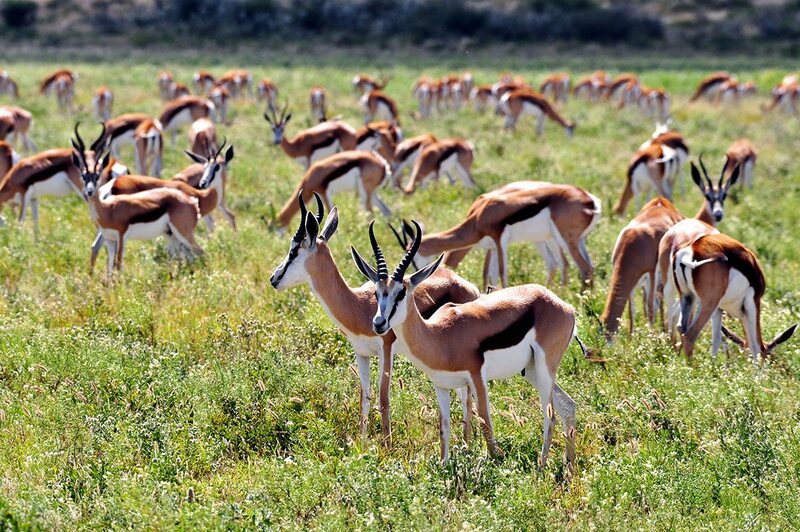 During a morning stop ‘to check the tyre pressure’ we happily debated whether springbok or oryx were the more handsome antelope – our guide, who had family in South Africa, was naturally a springbok fan, whereas we felt that the oryx was more striking. 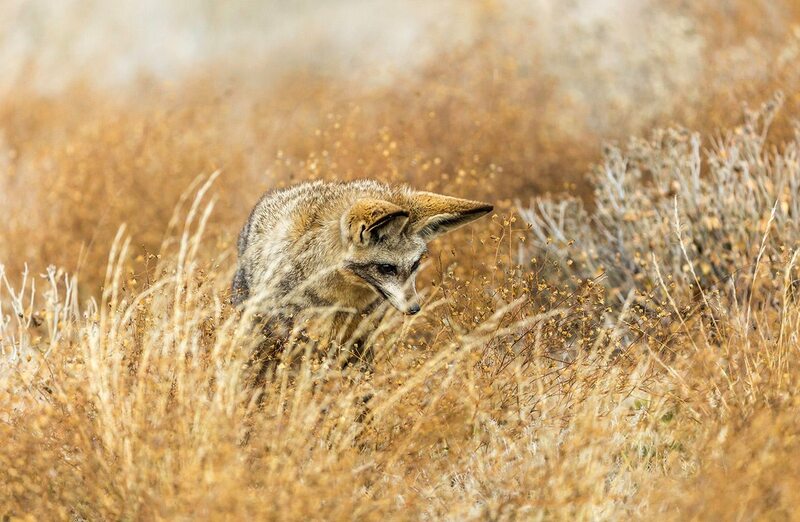 A passing jackal gave us a quizzical look as we crunched our rusks.If we had been becalmed in an ocean of grass, the roaring of lions during the night was the equivalent of a storm. We enjoyed the luxury of sitting on our viewing deck as the light strengthened and the sound washed over us. 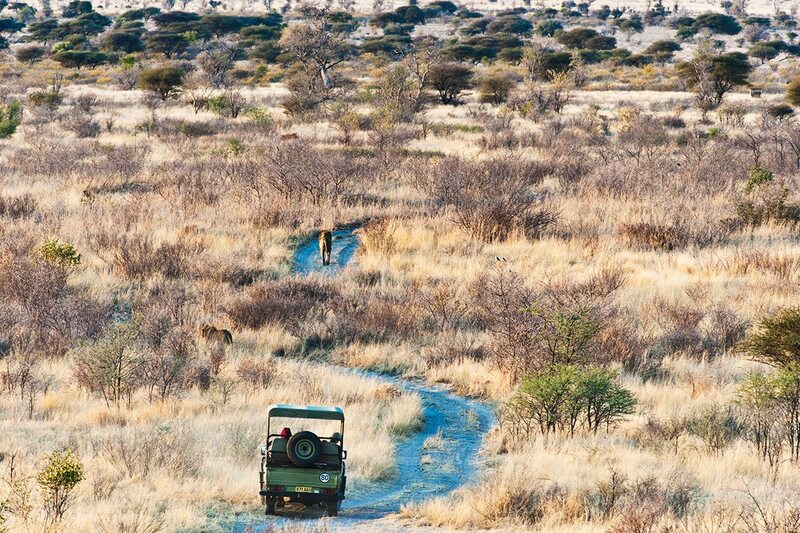 We had planned a San experience for the morning, but the black-maned lions of the Kalahari had other ideas. Our guide found the larger of the two brothers just a few hundred metres from the lodge. As we arrived, he got to his feet and led us to his brother, and we witnessed their surprisingly tender fraternal greetings. The flight from Maun into the Central Kalahari was nowhere near long enough to count as interplanetary travel, but the change in scenery was otherworldly. With the vast open space of Tau Pan stretching out below us, we felt as though we could see forever. This impression was not diminished by landing – from the sandy ridge where the lodge was situated, we could gaze across the waving grasses (newly green after the first summer rains) and count literally hundreds of oryx and springbok enjoying this bonanza. They had struck it lucky in terms of grazing; we had too, scenically-speaking. The rest of the day we relaxed. The next morning we chased away the briefest of pre-dawn chills with a coffee before heading out on our first Central Kalahari game drive. It felt almost being like on a boat as we parted the sea of grass, and at times, edged our way gently through the herds. 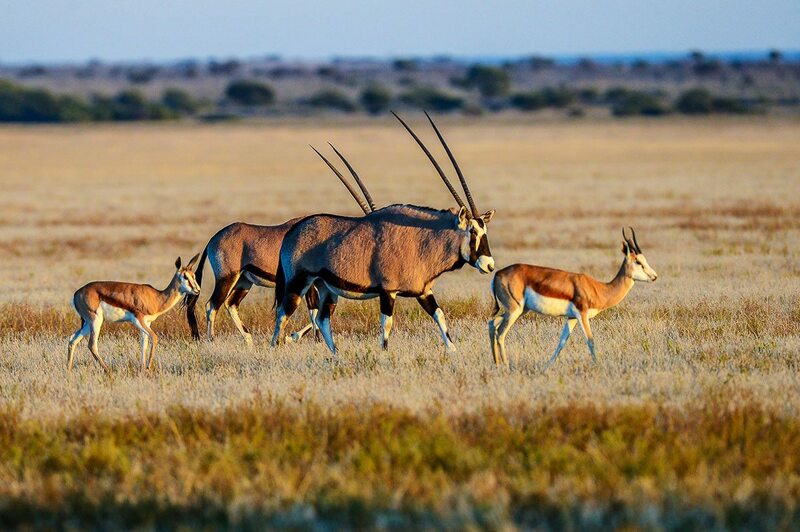 During a morning stop ‘to check the tyre pressure’ we happily debated whether springbok or oryx were the more handsome antelope – our guide, who had family in South Africa, was naturally a springbok fan, whereas we felt that the oryx was more striking. A passing jackal gave us a quizzical look as we crunched our rusks. If we had been becalmed in an ocean of grass, the roaring of lions during the night was the equivalent of a storm. We enjoyed the luxury of sitting on our viewing deck as the light strengthened and the sound washed over us. 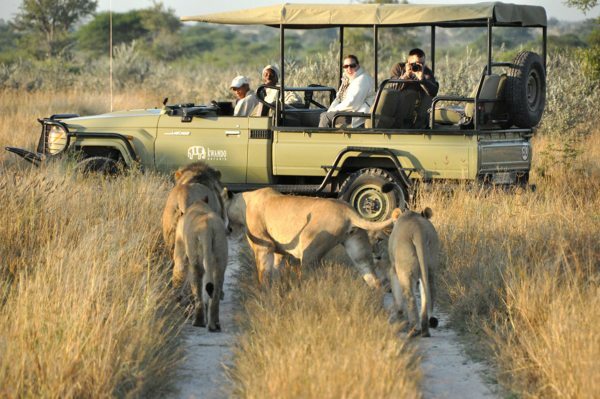 We had planned a San experience for the morning, but the black-maned lions of the Kalahari had other ideas. 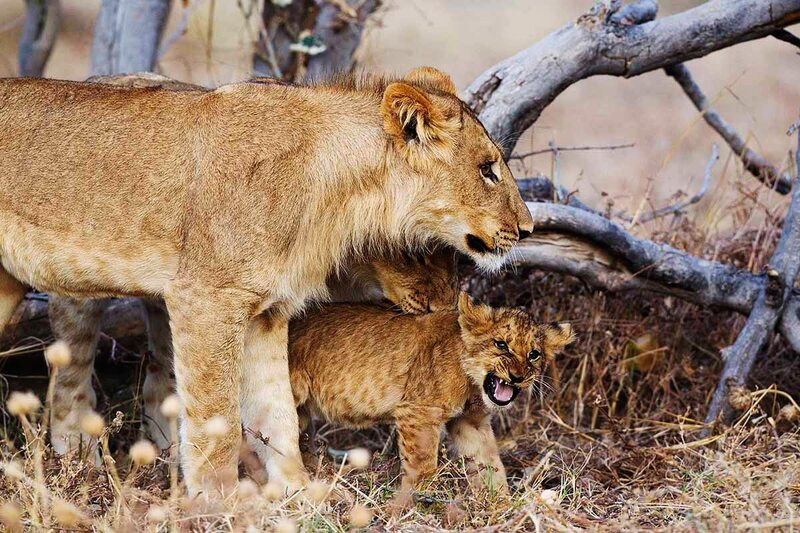 Our guide found the larger of the two brothers just a few hundred metres from the lodge. As we arrived, he got to his feet and led us to his brother, and we witnessed their surprisingly tender fraternal greetings. Before we flew on to Savute, we had time to enjoy a fascinating San walk around the lodge, learning ancient secrets which we traded for the mystery of flight as we climbed into a sky laden with the promise of rain and new life.The pilot had explained to us that the Savute Channel, impressive though it was, was far from a permanent feature of the landscape. We were keen to get a closer look at this mysterious river, and we needn’t have worried – our thatched chalet on stilts at Savute Safari Lodge had a great view down over it. 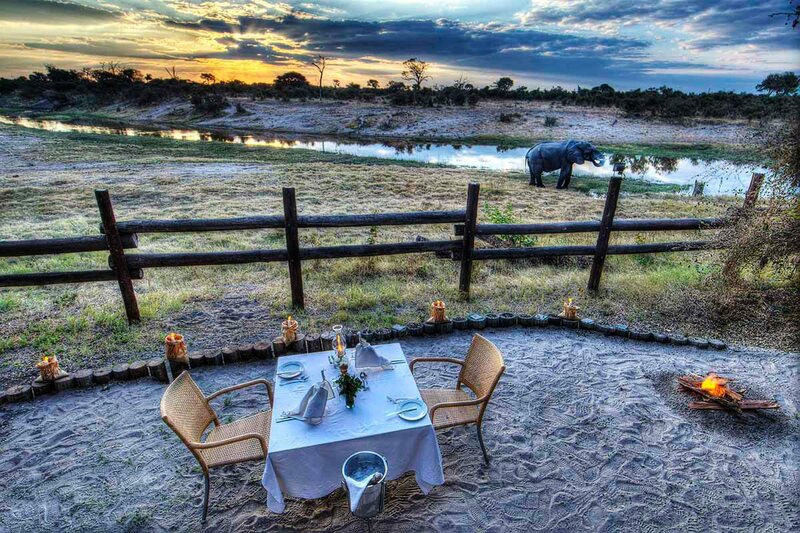 Although, to be honest, the water was often obscured by herds of elephant – not that we were complaining! Even during the lifetime of this luxury lodge, the channel had been absent, begun to flow, and reached the Savute Marsh for the first time in decades.Our San experience in the Central Kalahari had intrigued us, so when the lodge manager had mentioned over dinner that our guide could take us to a nearby San rock-art site, we leapt at the chance. The Gubatsa Hills were a distinctive feature in an otherwise largely flat landscape – which meant that the views, including knots of zebra from the migration, were spectacular. Our guide explained that the delicate, stylised animal drawings were believed to have brought tribal hunters good luck, and we liked to think of them as the first field guide, with oryx and giraffe readily recognisable.Of course our excursion to Gubatsa had been a safari in itself, but on our third day our inner photographers were keen to get a closer look at – and fill some memory card space with – the herds of zebra which ebbed and flowed along the channel. We spent a long, thrilling and ultimately satisfying game drive snapping stallions and mares, flanks and foals. Our guide surprised us by unloading picnic hampers under a leadwood tree; a further surprise came we he spotted a large python curled up in the fork of a branch, 15m above our heads. We didn’t invite it to join us. Before we flew on to Savute, we had time to enjoy a fascinating San walk around the lodge, learning ancient secrets which we traded for the mystery of flight as we climbed into a sky laden with the promise of rain and new life. The pilot had explained to us that the Savute Channel, impressive though it was, was far from a permanent feature of the landscape. We were keen to get a closer look at this mysterious river, and we needn’t have worried – our thatched chalet on stilts at Savute Safari Lodge had a great view down over it. 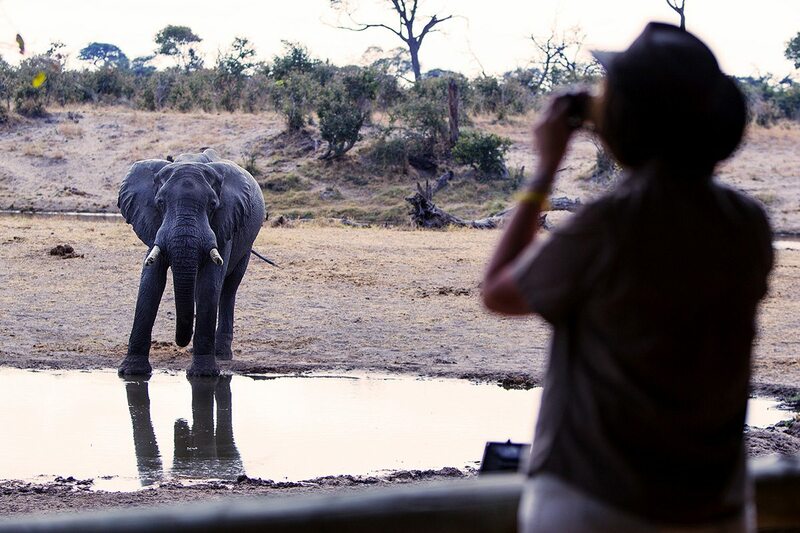 Although, to be honest, the water was often obscured by herds of elephant – not that we were complaining! Even during the lifetime of this luxury lodge, the channel had been absent, begun to flow, and reached the Savute Marsh for the first time in decades. Our San experience in the Central Kalahari had intrigued us, so when the lodge manager had mentioned over dinner that our guide could take us to a nearby San rock-art site, we leapt at the chance. The Gubatsa Hills were a distinctive feature in an otherwise largely flat landscape – which meant that the views, including knots of zebra from the migration, were spectacular. Our guide explained that the delicate, stylised animal drawings were believed to have brought tribal hunters good luck, and we liked to think of them as the first field guide, with oryx and giraffe readily recognisable. 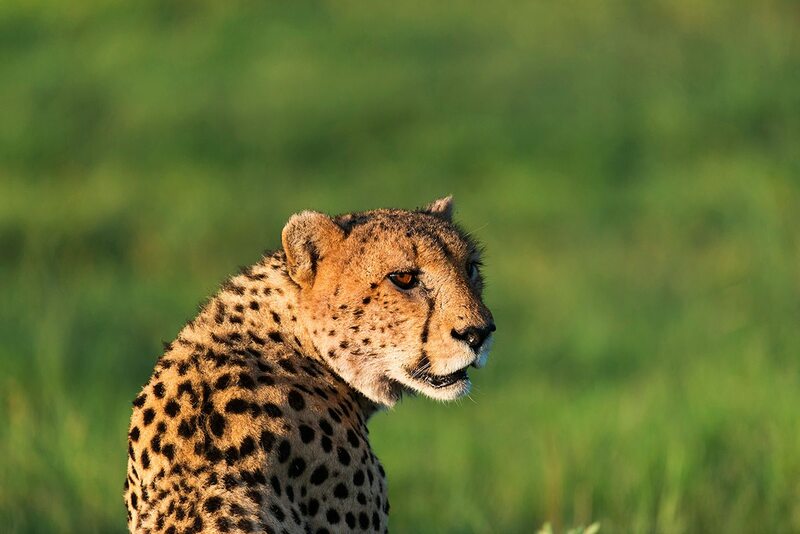 Of course our excursion to Gubatsa had been a safari in itself, but on our third day our inner photographers were keen to get a closer look at – and fill some memory card space with – the herds of zebra which ebbed and flowed along the channel. We spent a long, thrilling and ultimately satisfying game drive snapping stallions and mares, flanks and foals. Our guide surprised us by unloading picnic hampers under a leadwood tree; a further surprise came we he spotted a large python curled up in the fork of a branch, 15m above our heads. We didn’t invite it to join us. En route to Mozambique, we spent a night at a luxury hotel in Johannesburg to break our journey. This let us tune into the very different rhythms and energetic vibe of Africa’s most dynamic city, before we embarked the next morning by plane and, ultimately, helicopter, to land on an open stretch of white sand behind Azura Benguerra Island.We almost had to hold ourselves in check when we saw that the beach was just a few steps from our villa. We took a deep breath of fresh sea air, and then ran hand-in-hand down to where the waves caressed the shore. A few metres away, an inflatable bobbed on the slight swell, and a dhow was moored further out. Other than that, all we could see was ocean, and below us, only sand. Our two sets of footprints became three as Pedro, our private butler, caught up and offered each of us a fresh green coconut with a straw.Our desert island dreams became a reality when we were dropped off on a sandbar the next morning. We would hardly have to struggle to survive, as we had been furnished with a large parasol, a hamper of delicious snacks and even a bottle of sparkling wine on ice. The only small cloud on the horizon (a metaphorical one – the sky was pure cobalt) was the certainty that the crescent-shaped sandbar would ultimately return below the waves. Of course we were collected long before that, and in the interval we enjoyed a blissful castaway day, channelling Robinson Crusoe and Tom Hanks.The divemaster at the lodge had promised us a truly immersive experience, and snorkelling on the house reef the next day proved to be just that. The visibility below the surface was as astonishing as the warmth of the water was welcome, and we both had the sense of having gate-crashed a rather enjoyable – and colourful – party. The reef fish paid us no heed, but it was quite a different story with the turtles, who seemed intrigued by these masked interlopers. We were still marvelling over their agility that evening when we had dinner at the edge of the ocean, our feet in the sea.The last full day of our luxury safari found us lying on the loungers on our private deck, and taking dips in our plunge pool. Our safari and beach experiences had given us so much to talk about, but we also enjoyed long companionable silences, gazing out to sea. Later, we had our first taste of dhow life on a sunset cruise. The sun seemed to sink with an immense splash, but when this was repeated we realised that there was a pod of humpback whales breaching off our port bow. Our third migration, and the perfect end to our safari. En route to Mozambique, we spent a night at a luxury hotel in Johannesburg to break our journey. This let us tune into the very different rhythms and energetic vibe of Africa’s most dynamic city, before we embarked the next morning by plane and, ultimately, helicopter, to land on an open stretch of white sand behind Azura Benguerra Island. We almost had to hold ourselves in check when we saw that the beach was just a few steps from our villa. We took a deep breath of fresh sea air, and then ran hand-in-hand down to where the waves caressed the shore. A few metres away, an inflatable bobbed on the slight swell, and a dhow was moored further out. Other than that, all we could see was ocean, and below us, only sand. Our two sets of footprints became three as Pedro, our private butler, caught up and offered each of us a fresh green coconut with a straw. Our desert island dreams became a reality when we were dropped off on a sandbar the next morning. We would hardly have to struggle to survive, as we had been furnished with a large parasol, a hamper of delicious snacks and even a bottle of sparkling wine on ice. The only small cloud on the horizon (a metaphorical one – the sky was pure cobalt) was the certainty that the crescent-shaped sandbar would ultimately return below the waves. Of course we were collected long before that, and in the interval we enjoyed a blissful castaway day, channelling Robinson Crusoe and Tom Hanks. 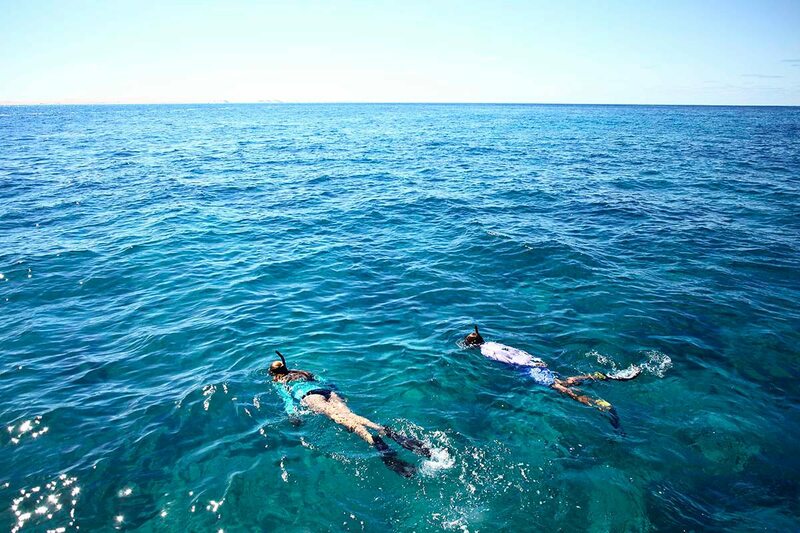 The divemaster at the lodge had promised us a truly immersive experience, and snorkelling on the house reef the next day proved to be just that. The visibility below the surface was as astonishing as the warmth of the water was welcome, and we both had the sense of having gate-crashed a rather enjoyable – and colourful – party. The reef fish paid us no heed, but it was quite a different story with the turtles, who seemed intrigued by these masked interlopers. 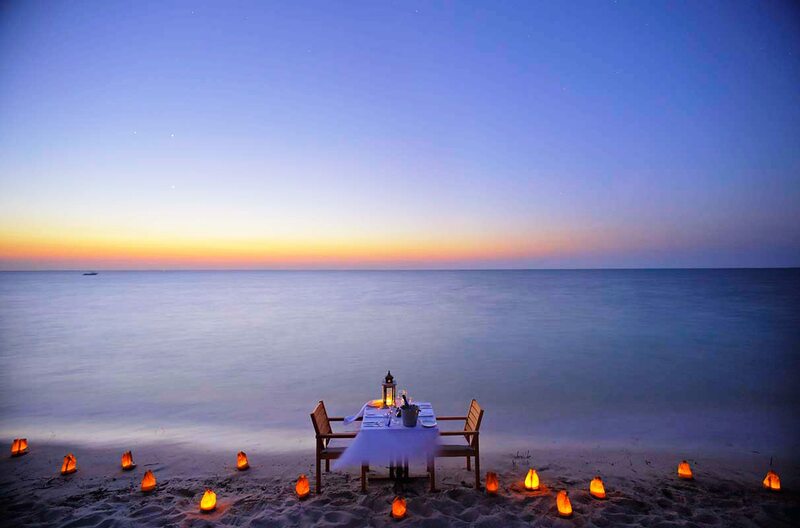 We were still marvelling over their agility that evening when we had dinner at the edge of the ocean, our feet in the sea. The last full day of our luxury safari found us lying on the loungers on our private deck, and taking dips in our plunge pool. Our safari and beach experiences had given us so much to talk about, but we also enjoyed long companionable silences, gazing out to sea. Later, we had our first taste of dhow life on a sunset cruise. The sun seemed to sink with an immense splash, but when this was repeated we realised that there was a pod of humpback whales breaching off our port bow. Our third migration, and the perfect end to our safari. Throughout our safari and beach exploration of Southern Africa we were conscious of the ancient rhythms of the continent – and, briefly, some more modern, urban vibes in Johannesburg – and how they were reflected in the swirling movements of water and the large herds of animals we saw.This sensation was reinforced by learning about the vagaries of the Savute Channel, also known as the ‘stolen river’ – a ribbon of water which snakes through northern Botswana for decades at a day, before periodically withering until it has completely vanished, only to then just as mysteriously reappear years later.The massed hooves of the oryx and springbok in the Central Kalahari beat out a tattoo in response to the pattering of the summer rain drops, their movements directed by the rains as they followed the clouds and the resultant green shoots, and were answered by the ceaseless journeying of the migrating zebra, ever in search of water.Of course these currents were most tangible when we lowered ourselves into the azure waters of Mozambique’s Bazaruto Archipelago and allowed them to pull us gently along the teeming reefs, or watched with only the faintest of unease as our picnic sandbar slowly began to slip beneath the rising tide.Whether it was in the tug of a maritime breeze on the sail of our dhow, or the ruffled mane of a stallion, we everywhere felt the pull of Africa, as we were drawn deeper into the beauty and mystery at each stage of our luxury safari. 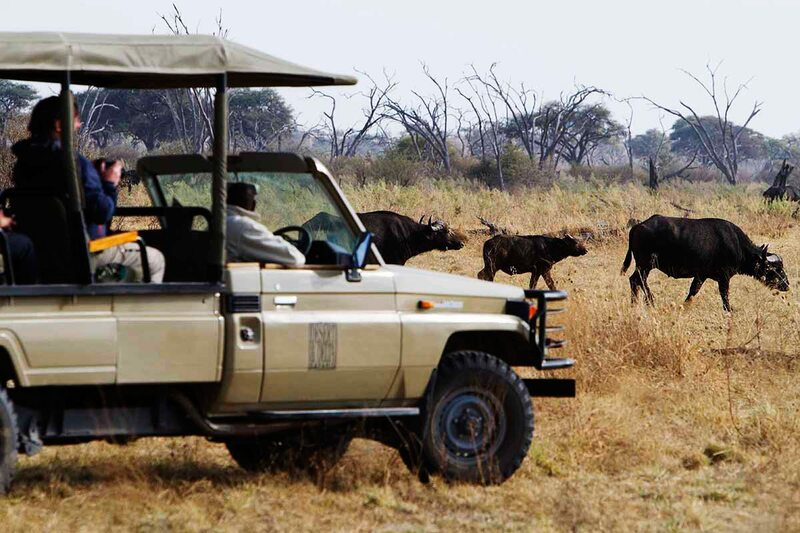 Throughout our safari and beach exploration of Southern Africa we were conscious of the ancient rhythms of the continent – and, briefly, some more modern, urban vibes in Johannesburg – and how they were reflected in the swirling movements of water and the large herds of animals we saw. This sensation was reinforced by learning about the vagaries of the Savute Channel, also known as the ‘stolen river’ – a ribbon of water which snakes through northern Botswana for decades at a day, before periodically withering until it has completely vanished, only to then just as mysteriously reappear years later. The massed hooves of the oryx and springbok in the Central Kalahari beat out a tattoo in response to the pattering of the summer rain drops, their movements directed by the rains as they followed the clouds and the resultant green shoots, and were answered by the ceaseless journeying of the migrating zebra, ever in search of water. 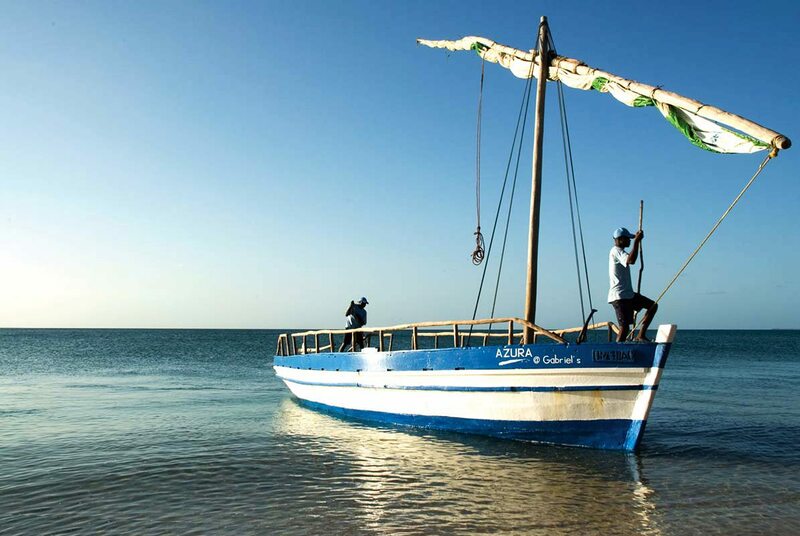 Of course these currents were most tangible when we lowered ourselves into the azure waters of Mozambique’s Bazaruto Archipelago and allowed them to pull us gently along the teeming reefs, or watched with only the faintest of unease as our picnic sandbar slowly began to slip beneath the rising tide. Whether it was in the tug of a maritime breeze on the sail of our dhow, or the ruffled mane of a stallion, we everywhere felt the pull of Africa, as we were drawn deeper into the beauty and mystery at each stage of our luxury safari. You’ll be met as you disembark from your international flight at OR Tambo International Airport in Johannesburg in South Africa, and assisted through customs and immigration. 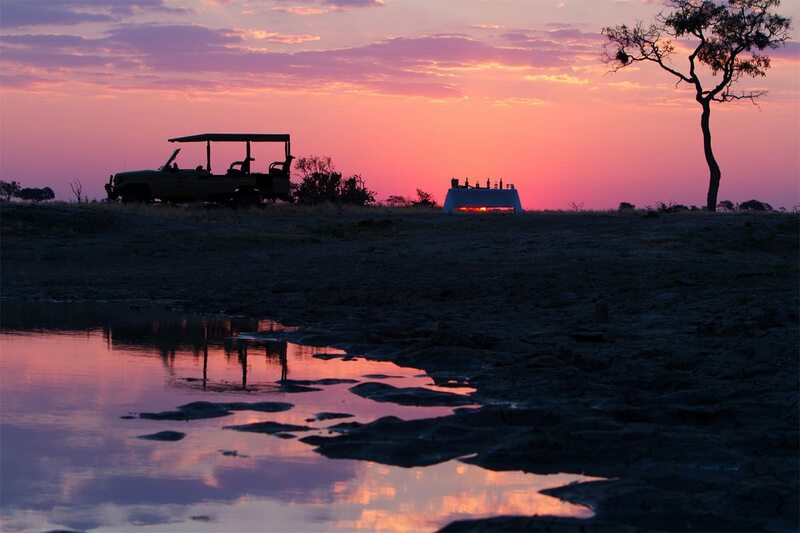 After a scheduled flight to Maun in Botswana, you’ll take a scheduled light-aircraft flight to the Central Kalahari. 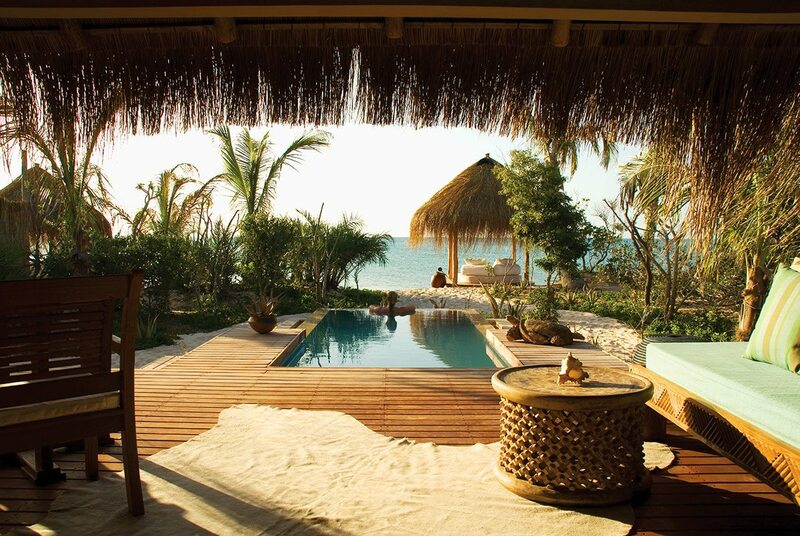 You’ll then take a transfer to Tau Pan, where you’ll spend three nights. After a transfer from Tau Pan to the airstrip, you’ll take a scheduled light-aircraft flight to the Savute. 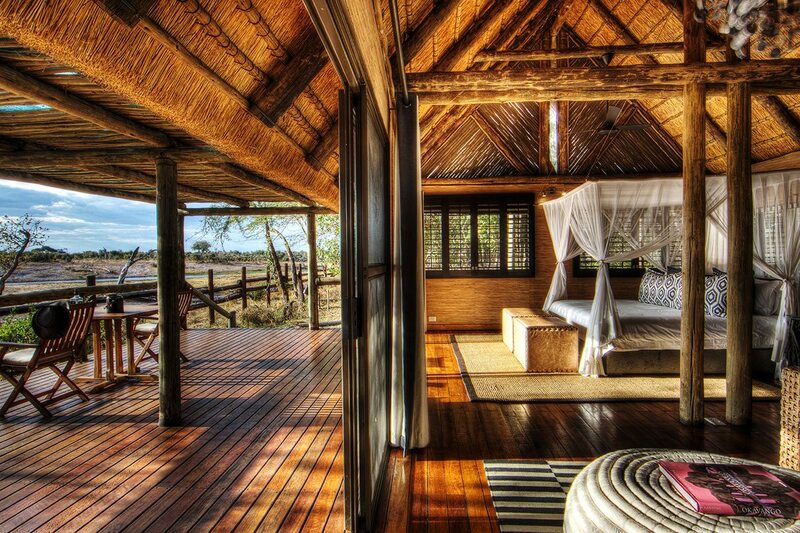 You’ll then take a transfer to Savute Safari Lodge, where you’ll spend three nights. 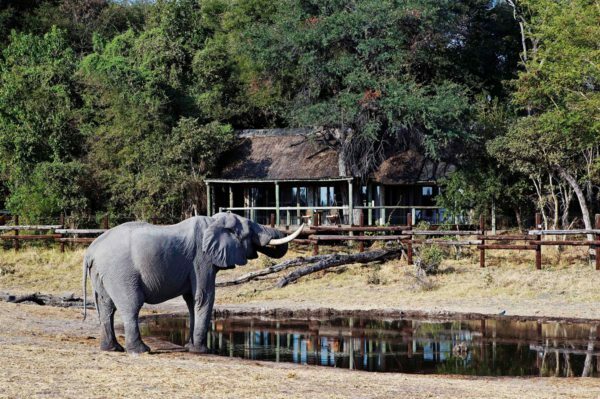 After a transfer from Savute Safari Lodge to the airstrip, you’ll take a scheduled light-aircraft flight to Maun. You’ll then take a scheduled flight to Johannesburg, South Africa. A transfer will take you to the InterContinental Johannesburg OR Tambo Airport Hotel, where you’ll spend the night. You’ll be met at the InterContinental Johannesburg OR Tambo Airport Hotel and assisted through check-in at the airport. 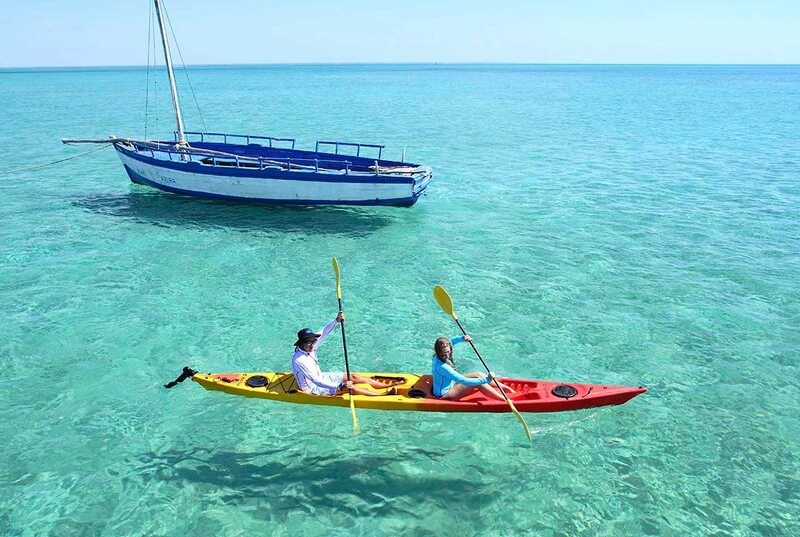 A scheduled flight will take you to Vilanculos in Mozambique, and then a helicopter will take you to Azura Benguerra Island. 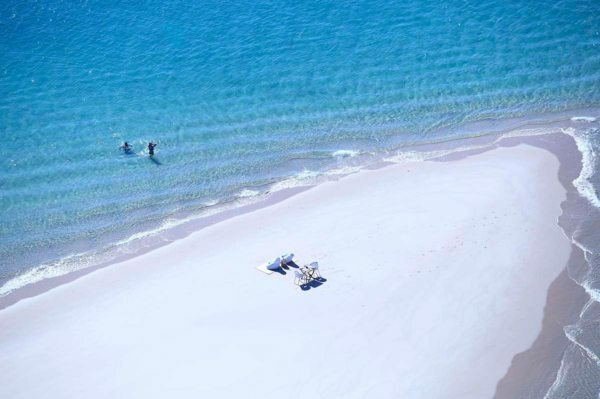 A helicopter will take you from Azura Benguerra Island to Vilanculos. A scheduled flight will then take you to OR Tambo International Airport in Johannesburg, South Africa, to connect with your international flight.